This house is located close to the sea. Therefore, the sea is visible from inside the house most of the parts. From the wooden terrace of 50 m2 of ground floor, you can admire the entrance to the port of Concarneau and the passage of fishing boats and yachting and the closed city. In winter as in summer, you can admire the arrival of boats in the port of Concarneau and enjoy the large terrace, equipped with a comfortable garden furniture and the outdoor table, for a lunch overlooking the harbor and the sea. Close town of Concarneau. A lovely house in a stunning location. Very well equipped, clean and comfortable. We enjoyed sitting on the patio watching the boats pass by. The walk along the coastal path was enjoyable with the ferry boat crossing to the ramparts and town. Quimper and Pont Aven are within easy reach and worth a visit, we especially enjoyed Port Du Guilvinec, and Cap Coz. A boat trip along the coast of Concarneau is also a must. We have had a great week, thank you Olivier ! Dieses Haus können wir wärmstens empfehlen. Gelegen in einem ruhigen Wohnviertel, 2 Bäcker + kleiner Lebensmittelladen + Metzger in Laufnähe, Zentrum Concarneau ca. 20 Minuten zu Fuß + Fähre oder ca. 5 Minuten per Auto. Das Haus sieht genau so aus wie auf den Fotos beschrieben. Wir haben es zu zweit bewohnt und fühlten uns sehr wohl, insbesondere die Küche ist extrem gut ausgestattet. Geschmackvolle Inneneinrichtung und sehr gute Betten. Haus liegt in der 2. Reihe in der Nähe des Küstenwanderwegs GR 34 und bietet schönen Meerblick, auch bei schlechtem Wetter durchs Wohnzimmerfenster. Der Ort Concarneau hat sich als idealer Standort erwiesen: beste touristische Infrastruktur bezüglich Restaurants, Geschäften, Sehenswürdigkeiten (z.B. Ville close), Spazierwegen + Stränden, aber auch französisches Alltagsleben (z.B. Werften + Fischfang). Der Kontakt mit dem Vermieter war sehr freundlich und unkompliziert. Die Betreuung vor Ort erfolgt durch Verwandte, die in Concarneau ein Geschäft betreiben; hier sind französische Sprachkenntnisse von Nutzen. Das Haus wird auf Wunsch mit Bettwäsche und Handtüchern vermietet, was in der Bretagne nicht selbstverständlich zu sein scheint, für Kleinwagenfahrer aber hilfreich ist. Die Endreinigung haben wir selber gemacht; ausreichend Putzmittel + Staubsauger stehen zur Verfügung. Gerne wieder! We are very happy that you had a good stay in our house and yous enjoyed your holidays in Concarneau. We will be very happy to welcome you a next time. We, two families from Sweden - 4 adults and 4 children, had a lovely time for two weeks in this well planed and equiped house. 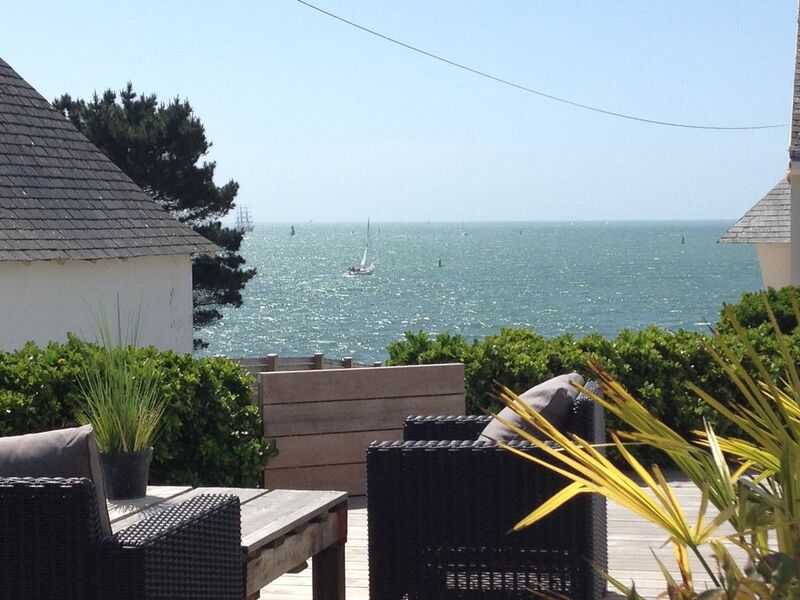 It also has a fantastic position with a beautiful view over the see and the harbour of Concarneau. Close to beach and town by the litle ferry. Best recomendations ! Nous avons passé un très bon séjour dans cette jolie maison. Une superbe vue, une maison fonctionnelle avec des rangements et de bons équipements pour une famille et un très bon accueil de la part du propriétaire . Je suis très content que votre séjour dans notre maison vous ait plu. Nous serons très heureux de vous accueillir de nouveau lors d’un prochain séjour. Festival of blue nets in August. Close to Quimper and Pont Aven.